Since our discussion about Where Our Fabrics Are Made, I've continued thinking about these issues. We have many choices when shopping for quilting cotton solids. The best brand for you will depend upon your needs and priorities. Here is a comparison of solid fabric lines with which I have personal experience. Like many, I started sewing with Kona Cotton solids. They're widely available and produced in tons of colors, 340 colors total at this time. If you are matching a particular hue, Kona Cottons has the most options to choose from. Kona has a durable, substantial weight and texture. Kona is manufactured in Korea/Indonesia/Thailand. The line is Oeko-Tex certified. I began experimenting with this line two years ago, attracted by this gorgeous set of Denyse Schmidt Modern Solids. Freespirit Designer Solids has about half as many colors as Kona (175), but the colors are quite modern and appealing. I actually prefer the Freespirit colors to Kona colors most of the time. Where colors are similar, Freespirit tends to have a little twist or added saturation that speaks to me. Freespirit solids feel like Kona, but have a touch more luster. Freespirit fabrics are dyed and/or printed in Korea. About a year ago I decided to test this quilting solids line. I made an entire quilt in American Made Brand solids. These fabrics are slightly lighter weight than Kona or Freespirit. The colors are nice, but limited to 75. That's just barely enough, but it works and could simplify stashing. The best thing about this brand is that it is grown and manufactured entirely in the United States. If you live in the U.S., buying this brand reduces your carbon footprint and has all the other benefits of buying local. My sponsor, Gotham Quilts, stocks this fabric line. 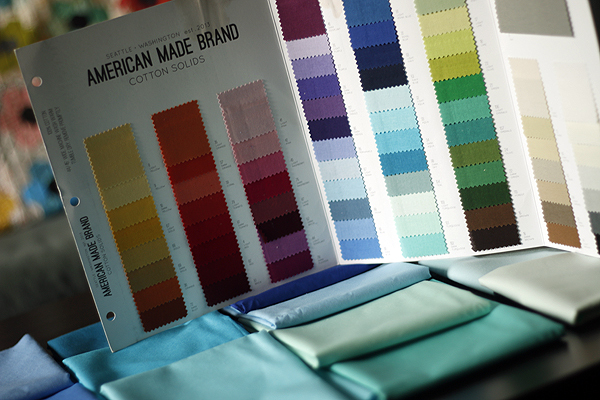 American Made Brand is grown, spun, woven and dyed in America. Right now I am sewing with Art Gallery Pure Elements for the first time. I am making a 100% Art Gallery quilt to see if I can "feel the difference" in the finished work. Definitely Art Gallery fabrics do feel different than Kona or Freespirit. They are thinner and slightly silkier. These solids have a luster like Freespirit solids, but they are lightweight like American Made Brand solids. The Pure Elements line includes just 73 colors. Art Gallery fabrics are dyed or printed in South Korea in mills that are Oeko-Tex and GOTS certified. This line is new to me. In fact, I heard of Hoffman Indah Solids from some well-informed readers. Hoffman is admired for their environmental responsibility. At the Hoffman factory in Bali, a modern water-filtration system returns rinsewater clear to the environment (see video). This is a unique and forward-thinking system that has been in operation for more than a decade. The solids are dyed in the same facility. My sponsor, The Confident Stitch, is building an inventory of Hoffman solids. They sent me some fat quarters to sample. The colors are vivid and even. The fabric is considered a poplin. It is lighter than Kona and Freespirit and crisp as compared to Art Gallery. The fabrics are woven and hand dyed in Bali, Indonesia. Choosing based on color and feel, I prefer Freespirit Designer Solids. Others may prefer a lighter weight fabric such as Art Gallery. I happen to have many fabrics by Freespirit or Robert Kaufman, so the heavier solid lines mix better with my fabrics. If you sew more with Art Gallery or want to mix solids with voile, the lighter weight lines will be a better match. Having a consistent weight fabric in your quilts can improve durability. Choosing based on sustainability, I prefer American Made Brand because they use the least fossil fuels. I respect the Hoffman line, but don't prefer the poplin hand. None of these brands are "bad" choices! They will meet different needs for different people. I hope this comparison is helpful!